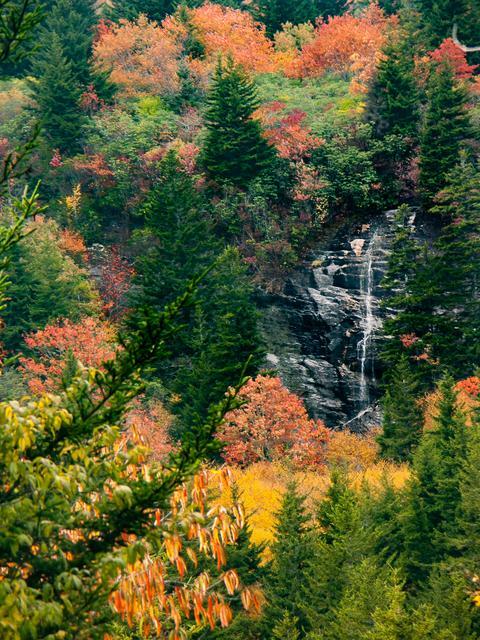 There are so many waterfalls in the upper West Fork Pigeon River valley that most of them are unnamed. 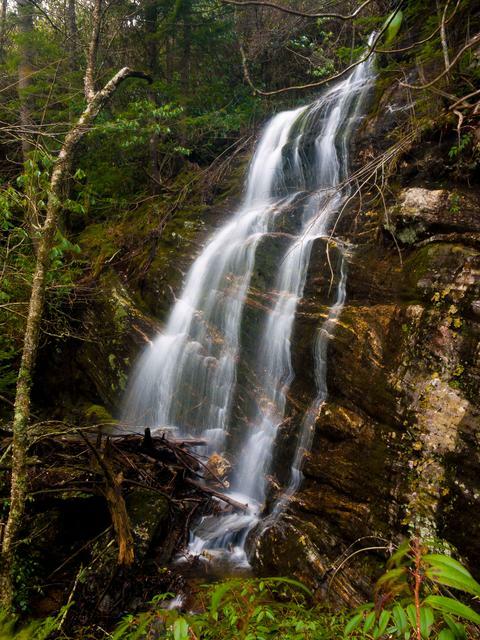 This one is no exception - I've seen one reference to it being called Mount Hardy Falls since it flows off the side of Mount Hardy, so we'll go with that. It's located at the very headwaters of the main branch of the the river, just a tiny creek at this point. I think it's one of the finest waterfalls in the area. But it's a high-elevation falls, best viewed in wet weather. Thanks to the water that gathers in boggy areas on the tiny little plateau above the cliff, there seems to be some flow even in very dry weather too, though. From the intersection of the Blue Ridge Parkway and NC Hwy 215, drive about 1/2 mile north on 215 and park in the large gravel pull off on the left. The hike to the falls is about 1/2 hour (not sure the exact distance) and moderate if you just hike to the viewpoint, or difficult if you hike to the base. The Mountains to Sea Trail crosses the highway just down from the lot. Take the trail on the west side of the highway (the downhill trailhead, not the one leading up the steps). The trail immediately crosses Bubbling Spring Branch and starts back uphill through a spruce-fir forest, heading north. 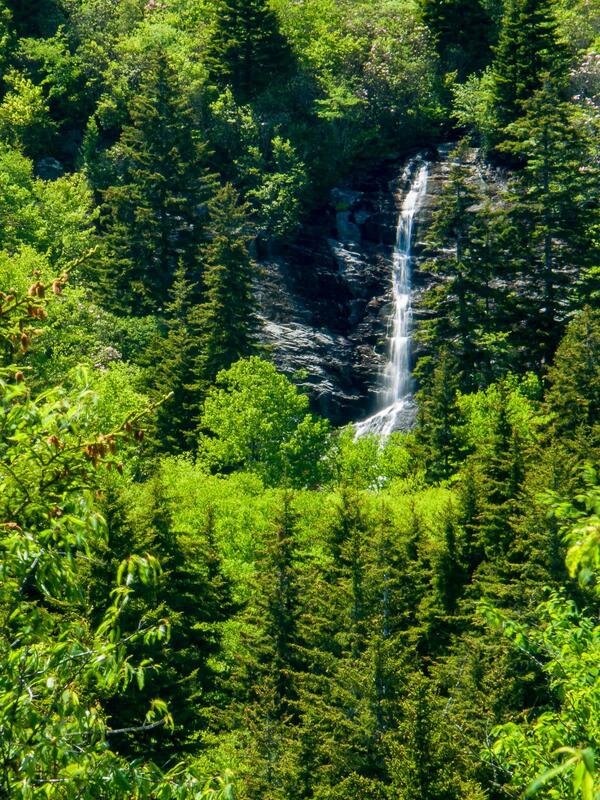 (If the branch is to high to rock-hop - which is a a great time to visit this falls - cross it on the highway instead and come back to the trail through the woods on the other side). View from the trail in fall. This gentle ascent continues through boggy areas until reaching a large clearing. Pass through the clearing, bearing left at an intersection with a side path. The trail wraps around to start heading south again on a gentle ascent, with only a few tricky spots. It eventually catches up with the creek and crosses a tributary of it coming in from the left. There are two ways to view the falls: from the trail, and from the base. To get to the trail view, continue up the trail between the two branches of the creek. The right branch (which contains the waterfall) pulls away as the trail swings left. The trail crosses some seeps and brooks which come together to form the left-hand branch and starts ascending the ridge. Shortly, you'll come to a right-hand switchback, and then the trail enters a more open area. There is a good view of the upper part of the falls across the valley from here. View of the falls from the base. To get to the base, "simply" follow the right hand fork of the stream back at the first crossing. It's mostly open forest and an easy bushwhack until you reach the rhododendron and doghobble thicket closer to the falls. The easiest way around this mess is to bear right until you reach the base of a cliff. Follow the cliff left, up to the base of the falls. It's hard to see the upper section of the falls, but the lower section is nice, save for some downfall at the bottom.